KEY FACTS: Attenborough was born in London, England and spent his childhood collecting fossils and stones. He had a fascination with nature and went on to study natural sciences at The University of Cambridge. 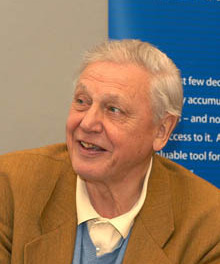 Throughout his time working for the BBC, Attenborough has presented and been involved in the making of many programmes including Zoo Quest, Life on Earth, The Living Planet, Planet Earth and The Blue Planet. ACHIEVEMENTS: Attenborough has been called ‘the greatest broadcaster of his time’ and is known internationally for his work. He has an honorary Doctor of Science award from both Oxford and Cambridge University. Many species of plant and animal have also been named in his honour.